Week, the country is observing another safety week. From October 7 to 13, the National Fire Protection Association (NFPA), the U.S. Fire Administration and fire departments nationwide are marking National Fire Prevention Week. Of course, we’re on board with the effort because some 80,000 residential structure fires each year are related to fireplace chimneys and chimneys connected to home heating systems, according to the most recent data available from the U.S. Consumer Product Safety Commission. 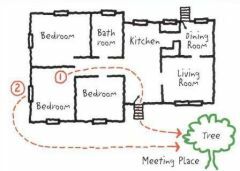 The theme for Fire Prevention Week is Have Two Ways Out, a reference to how many escape plans you should have for exiting the rooms of your home in the event of a fire. Draw a map of each level of your home and show all doors and windows. Have two ways out of each room. Make sure all doors and windows that lead outside open easily.